Formed in 1984 to smash juvenile frustration and aggression into a hostile world with terms such as Death, Doom & Thrash Metal. Their first demo had remarkable airplay in US-underground radio stations and even reached No.1 for several weeks. Excruciation’s first official release “The last Judgment” sold over 15,000 copies and reached Switzerland’s Top 100. 20’000 copies , a very respectable amount at the time for an underground metal release. In 1991 due to various musical and personal differences EXCRUCIATION took an indefinite time out. In 2005 for old times’ sake and seemingly long forgotten friendship all the original members came together again. in 2005 “Arise“ saw the light of day! released [t]horns on vinyl in 2013. "In remembrance of all those souls who lost their young lives at Waldniel Hostert /Kent School from 1937 to 1943. 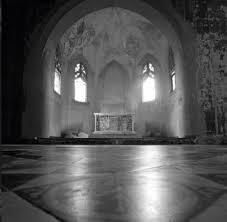 May their ghosts be the hosts of our memory fot time and time again. Never again." "I have seen Hell in Murmansk"
Fans of Doom Metal where are you? It's time for an unexpected spell, casted upon you by a mesmerizing album. Do you want to feel a sense of anguish and death brought by memorable melodies and by solid riffs? 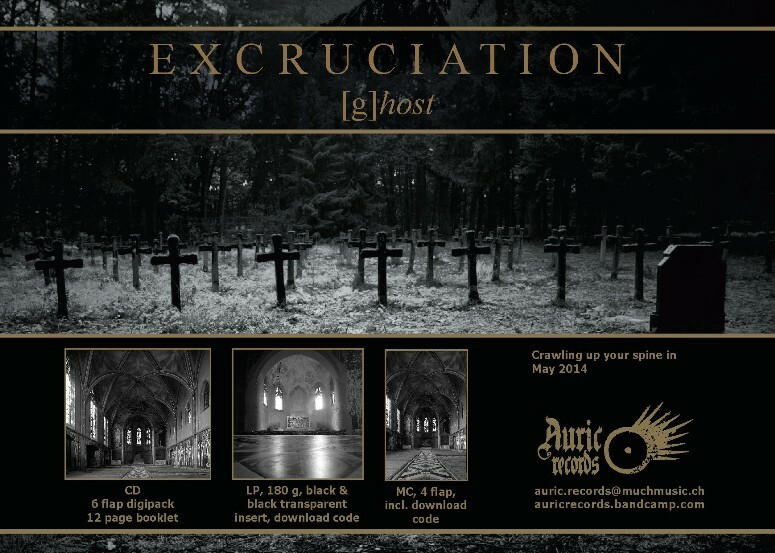 May 2014 has just come to its end but has left a fresh released gift for you: an awesome album indeed, entitled [g]host from the Swiss band Excruciation (label Auric Records). I adored and still love “Angels to Some, Demons to Others“ from this band, their 2007 CD whose follower was the LP [t]horns in 2009. The Swiss kings of Doom have created now, after the 2013 EP "Worship", another little masterpiece, their third studio album which is again very emotional, and (again) very intelligent: [g]host . The package is elegant, the booklet is incredibly interesting with lyrics, symbols and photos of Waldniel Hostert facility (where Nazis euthanized in horrible way handicapped children, now a spooky place for sale) , which will anchor your attention and will invite you to a dark journey into some deprecable moments of mankind`s recent history. In [g]host, that sense of desperation , typical of this musical subgenre, roots back to a past that should be never forgotten, because it should be never be repeated. The music, composed mainly by guitarist Hannes (HNS) Reitze is harmony of pain and grief, with a distinctive distorted slow rhythmic sound in which icy clear lead guitars are nested . The lyrics, by frontman Eugenio Meccariello , describe an abyss of darkness in which the humanity has been able to fall in. The opener While The Sea Mounts Up is magic yet at the same time fear inspiring. It is an example of Doom with modern psychedelic elements and rock gothic atmospheres for 5 minutes of involving , reiterate loops which are always fresh and reinvente themselves thanks to a great capacity of small but significative tempo changes and to the dance of the previous mentioned multilayered atmosphere. This track is the ideal opener with quite long surreal instrumental intro until Meccariello`s clean and robust vocals tell us then about the "ghosts" of the seas. Mother South in pure Death-Doom has powerful melody as well as touching guitar riffs. It is one of the longest tracks of this album ( 6:40), but you dont even perceive it. Under The Linden Tree is angrier and rocks a lot, yet it shows sacral facettes at the end when words of exorcism are clear and spoken in Latin. Murmansk II (associated with a videoclip) is the hit that lets the heart beat faster because this track is faster paced, with faster riffs and a faster and mighty groove. Then comes the moment to enjoy 3 minutes of instrumental interlude, composed by HNS Reitze: Ghost (An Interlude) marked by intertwined beatiful guitars which represent the summit of a spheric ghostly atmosphere. At this point, this breathtaking album has already enchanted and involved us. So comes implacable the splendid Crawl, characterized by memorable loop, increasing crushing intensity, unholy vocals. Its lead guitar is addiction and perdition, so beautiful, so clear, so agonizing. the first time i listened to the CD,i was occupied of rewinding infinite times Crawl and i didnt even want to hear the last 3 songs. I didnt want to end up disappointed, the album for me could have ended here, in the neverending agony of Crawl. But i know that Excruciation dont insert any filler in their albums: every song is a doomy rocking anthem. Indeed i asked myself then why i have waited so long to approach Sacrum Quod Vivit which is another killer because its middle part rocks enough. Murmansk I is slower, nostalgic. Devil Wears Christ is full of disdain, of disillusion and is, how i can say..., the sour side of this album; the only song that doesnt get me crazy. Its outro closes the album in a last solo, in a last slow anguishing mood.